Frank was one of the first Wabash students to get a SEED Grant through the Schroeder Center for Career Development. Frank picked up a small grant to fund his idea for a new business. 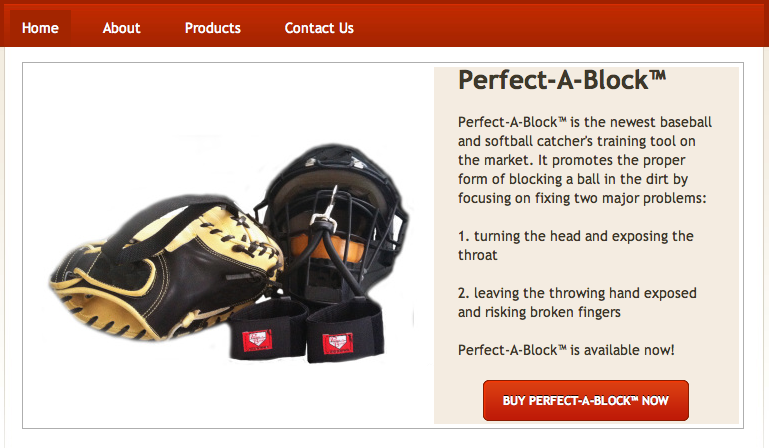 Combine entrepreneurial spirit with some market savvy and that innovative drive – you have Perfect-A-Block! Check it out! The artwork of Zach Medler ’01 will be part of the Exhibition at the Tippecanoe Arts Federation beginning August 9th and running through September 13th. Zach will create an interactive life-size diorama called “County Fair” in the west gallery. 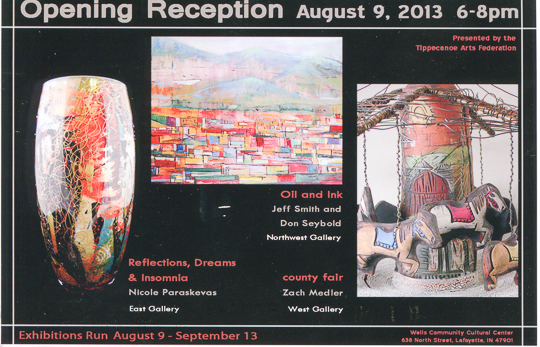 The opening reception is Friday, August 9th from 6:00 PM to 8:00 PM. For more information, go to www.tippecanoearts.org. Speaking of the Wabash Network! This guest post from Tim Guiden ’82. Wally from the Class of 1991 or 1992, identify yourself and finish our story! I am reminded of the book “Travels with Charley” by Steinbeck. 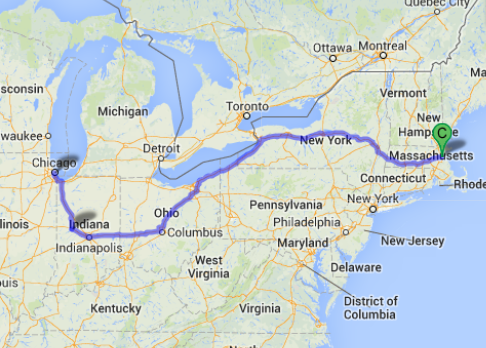 Every summer I get a travel update from alumnus Charlie Crowley ’70. 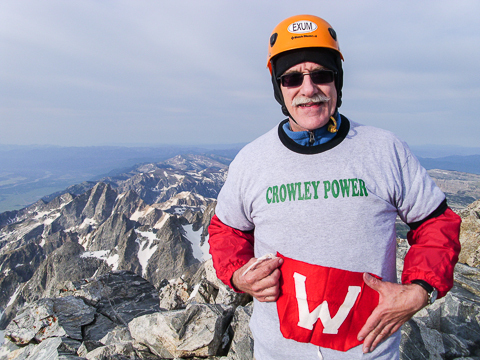 This time he checks in from the top of the Grand Teton. Reminds me that I need a lightweight Wabash flag for the next Grand Cnyon excursion. This comes from Scott Crawford, director of the Schroeder Center for Career Development (SCC). I told him to get me a quick job description and we’d do a super quick résumé referral. That afternoon we posted in WabashWorks and put messages out on our and the Alumni LinkedIn groups, in addition to emailing alumni registered in WabashWorks. Told them to apply NOW. Three guys responded and lo and behold, Rob Harvey ’10, from the Boston area, accepted an offer and starts this Monday (July 22)! 1. Are you in WabashWorks (if not, contact SCC)? 2. Is your resume up-to-date? 3. Are you a member of our Linkedin Alumni Group? 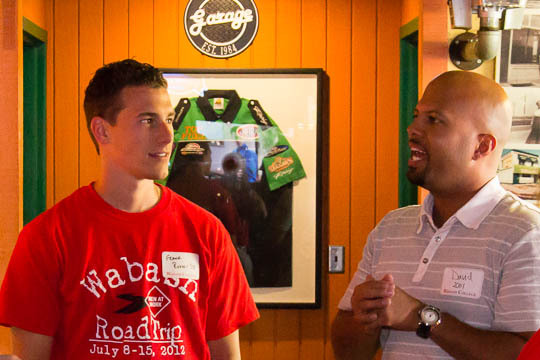 Wabash students are out and about this summer learning life in that real world out there. Take a moment and catch up with them through a couple of blogs associated with the Schroeder Center for Career Development. Tell them the Grunge sent you. That’s It – I Am Officially Ancient! 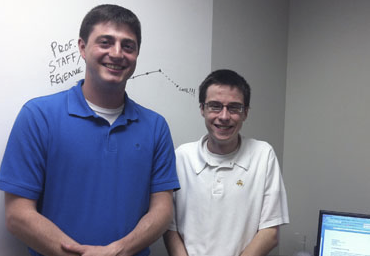 This fall Wabash will welcome back two fantastic young men – Olmy Olmstead and Fran Raycroft. Both talented young guys – Olmy played football and Fran was a star in Biology. Olmy Olmstead, Class of 2004, is back as a football and track coach. Fran Raycroft, Class of 2006, is back as a visiting instructor in Bio. That makes the Grunge, Class of ALTA (A Long Time Ago), officially ancient. Olmy and I have stayed in contact over the years. He had coaching in his blood even as a student. I’ve caught up with Olmy, and his family, at away football games on the rare occasion that his team at the time wasn’t playing. 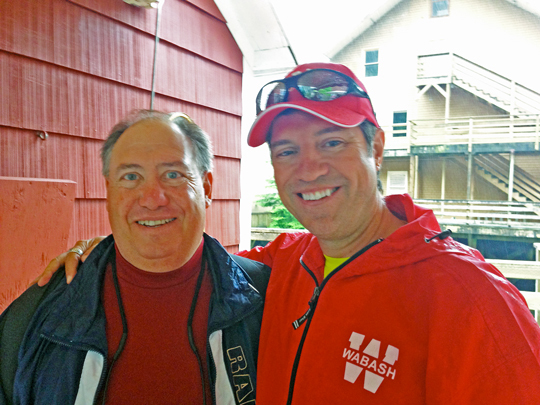 Olmy…his parents…and his grandparents are true Wabash fans…it will be super to see a lot more of them. Fran went from the ‘Bash to another of my favorites, the University of Notre Dame. I caught up with him when he was a summer intern there – before he went to grad school. I remember clearly the Biology faculty member at ND telling me he sure hoped Fran would attend grad school there. The ultimate compliment…for Fran and Wabash. From students as campus difference makers to guys molding our students. It’s great to have Olmy and Fran back on campus! But man – am I old or what? 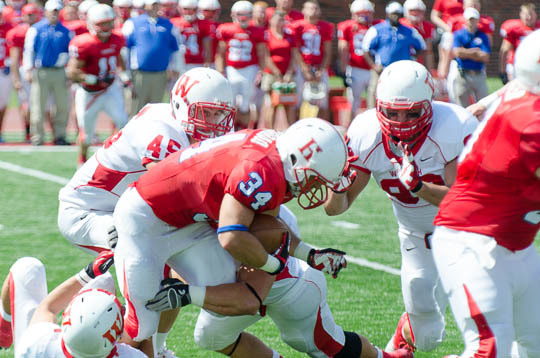 Wabash Ranked #7 Nationally – We Want More! 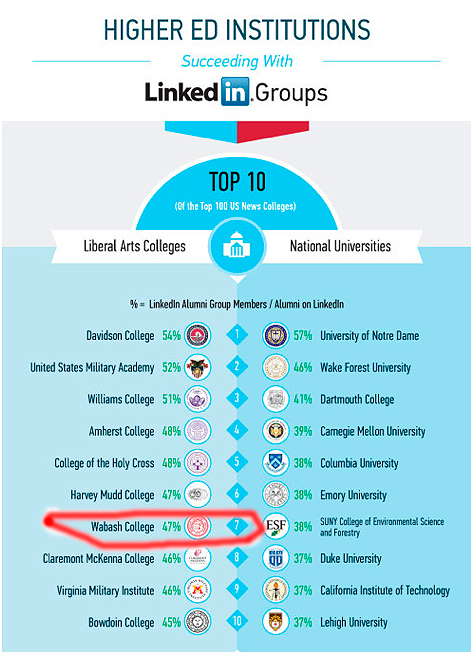 Wabash College is ranked # 7 in the Nation among Liberal Arts College and their Linkedin presence. That places our college in with some very elite institutions. The calculation is simple – the college’s Linkedin group total membership divided by the number of Wabash alumni on Linkedin. Join us today…here’s the link. 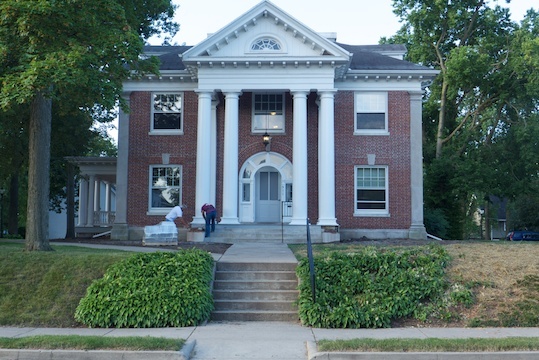 Kane House – which has been about 627 different things during its tenure here – is getting a new look. Gone are the huge shrubs that flanked the front and side porches. With their departure, a lot of hiding places also went by the wayside. The big tree that say just to the right of the entrance is also gone. There is no truth to the rumor that a couple of TKE and Beta pledges were found asleep next to the porch! It will be ready to go by the time school starts, I’m sure. Two months from yesterday – September 14, 2013. Football returns to Wabash as the Little Giants will host Hanover. Seems like forever since we won the Monon Bell game last November – that was four Bell game victories in a row, as I recall! New group of coaches…new group of players…new season.